Today we are very excited to launch our first major Craft CMS plugin, Calendar! The Solspace Calendar plugin offers up both power and simplicity, giving you all kinds of options to satisfy your calendaring needs. Need a simple display of daily activities? How about a monthly calendar? Need to fully control every table, div, and class that makes up the HTML that will become your calendar? Solspace Calendar can do all of that and more. Watch the video below in full screen to get a taste of it! Solspace Calendar is an Element Type that allows you create and manage event entries similar to regular Craft Entries. The control panel also includes a groundbreaking approach to event management that feels very similar to popular calendaring apps like Apple Calendar and Google Calendar. Similar to these popular calendaring apps, Solspace Calendar allows you to view a full month, week and day view of your existing events, and click on any day of the month or time slot to create new events, click on existing events to edit them, and drag and drop events to move them to other days or times. Hat tip to FullCalendar JS library for this one! 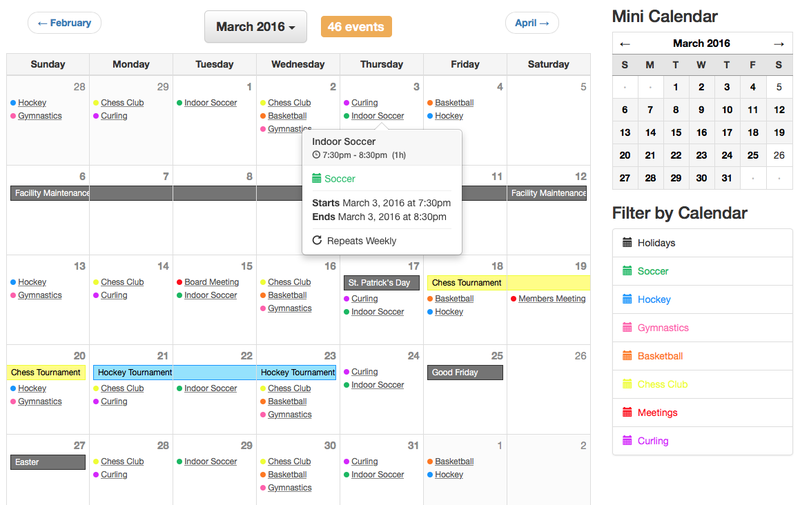 You can also manage your own set of calendars that become available to assign to each event. Each calendar can be assigned a color, which is already accounted for in the control panel and easily accessible to front end templates, making adding a splash of color and styling a breeze! Events in Solspace Calendar allow you to make recurrence rules and exclusion dates. Need weekly events? Have a group that meets on the 3rd Tuesday of every month? How about a monthly meeting that does not meet during the summer? Solspace Calendar can do all of that. Solspace Calendar, like all of our addons/plugins, comes with rock solid support and a 30 day no questions asked money back guarantee! So try Calendar today!